An age-old adage. Perfectly true. However, the very best refinishing stands apart from the rest. This requires skill, experience and the correct materials for the job. No two painting jobs are exactly the same, presenting different challenges to the painter requiring perfection in his work. 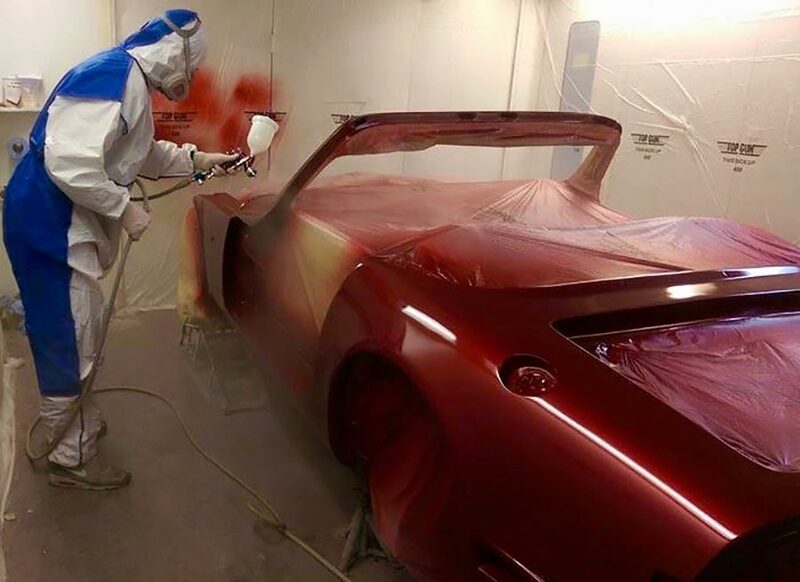 The perfect paint job is a result of high quality preparation, skilled spray painting and diligent final finishing of the newly painted surface. We are very proud of our paintwork. We do not have varying standards of work to suit vehicle or budget. Many of our paint jobs have won prizes in shows throughout the country but we do not have a “show” standard. Every vehicle will receive the same care and meticulous attention to detail. Very few bodyshops can match this comprehensively or consistently. We call this the Option 1 standard. In the last ten years almost all vehicle manufacturers have used the same type of paint; a water based colour coat followed by a solvent based 2K clear lacquer coat. This is relatively easy to replicate if the correct materials and techniques are employed. Unfortunately older vehicles may have been painted in a variety of material options, oil based, cellulose, single layer (1K) metallic, or solvent based colour layers. 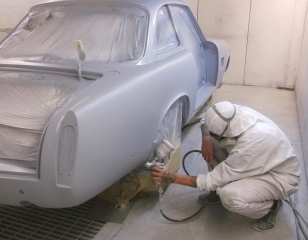 When working on older vehicles, or vehicles which are not factory paint alone, it is vital to identify the type of paint on the car. Failure to do this may result in chemical paint reactions to the substrate , severe finish or colour match issues and long term problems with the newly painted surface. There is no easy way to do this. Paint thickness gauges and chemical tests will help but years of experience is the primary solution. Often a customer owning a car that is just a few years old will entrust a repair, only to be told “it’s been painted before so we can’t match the colour” and worse, “that’s the best we can do”. 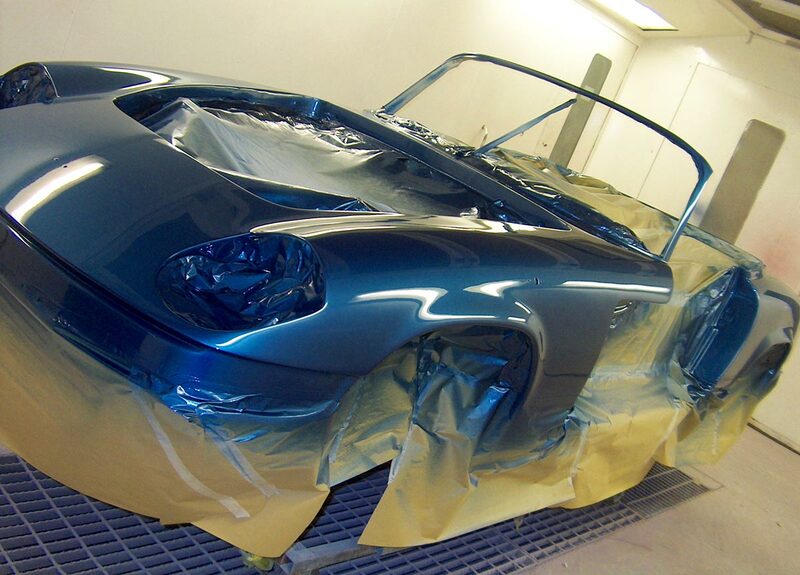 Older vehicles can very problematical for many body shops. Their painters often only know how to paint contemporary water based paint and lacquer as this is what they use every day and are experts with this system. However these materials are not always the best for the job in hand. The paint staff at Option 1 varies in age and has a combined experience of well over fifty years. The oldest member of the team (Frank) painted his first car at eleven years old in his father’s garage. He has used just about every type of paint available. One of the youngest (Mikey) loves custom work and air brushing and is always trying out the very latest weird and wonderful paints. 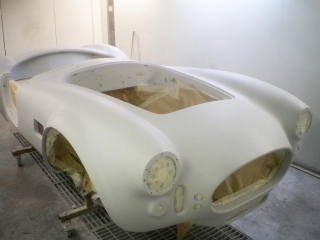 As we work on a wide range of vehicles from classics to brand new our knowledge of materials is vast. There isn’t much we don’t know about paint. And we are still learning. Obviously there are thousands of car colours. Usually a car will have a paint code somewhere on the body to identify the colour. 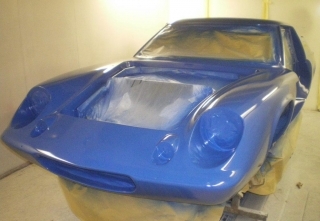 However, manufacturers sometimes have more than one painting plant, using slightly differing techniques or worse may change supplier of paint, mid production, the end result being vehicles of the same make and colour code but being very slightly different in colour. These are called colour shades and are surprisingly common in the industry. Some colours which have been used for many years can have a bewildering number of shades. Ford Diamond White for example, used from the early 70’s and still in production can have as many as thirty different shades dependent on the paint manufacturer chosen! Having identified the colour name and code, most painters will then look at colour charts or “chips”. All good bodyshops have these. Unfortunately colour chips are rarely 100% accurate and spraying technique alone can also change colour, slightly. 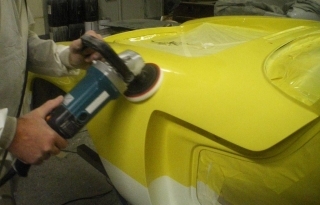 The very best bodyshops will use an electronic colour matching machine or Spectrophotometer. We have one, and it’s very useful on some vehicles. However even this is not as accurate as the human eye. 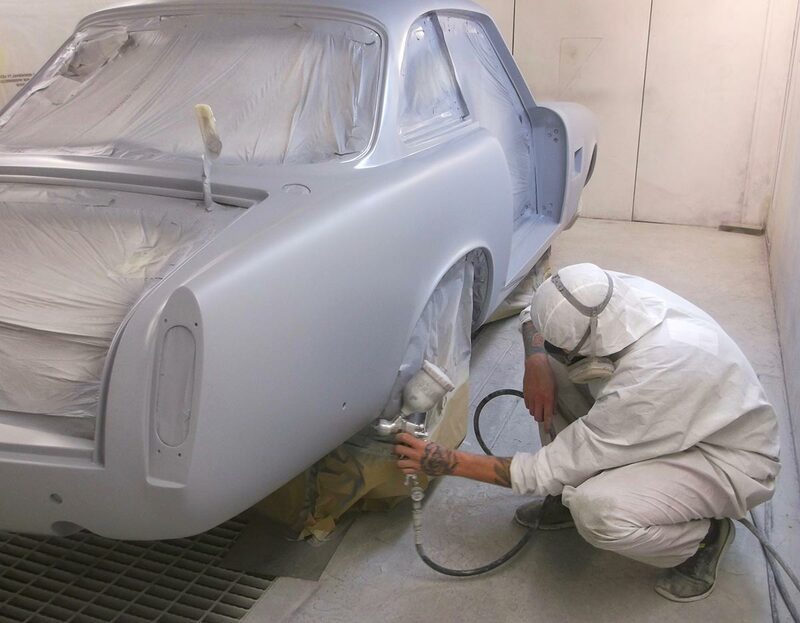 Whenever possible, at Option 1 we will identify the actual manufacturer of the paint on the vehicle as colours vary from different paint companies. Then, using the manufacturer’s paint formulation we will mix and spray a test sample to compare with the car. If the colour match is inaccurate we will use another shade, or tint the colour to match exactly. 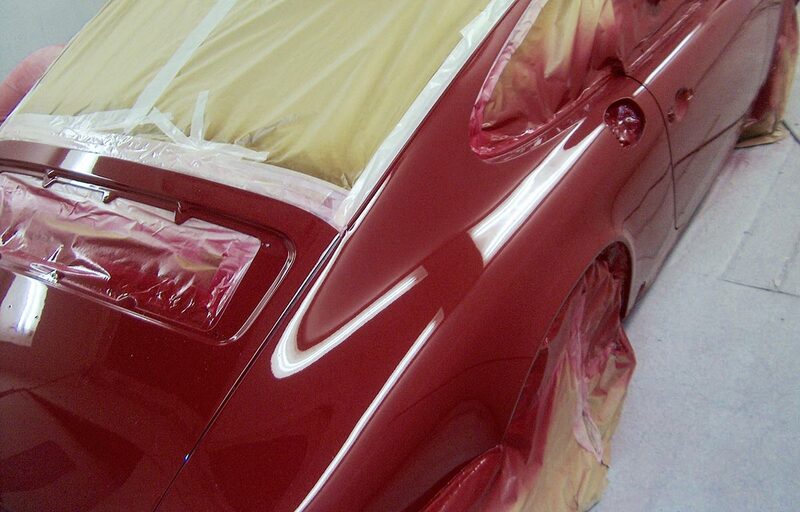 Only when completely satisfied will we begin applying colour to the actual panel or vehicle. Any car requiring a repair and not a complete respray will need special attention to matching the original paint colour and finish. 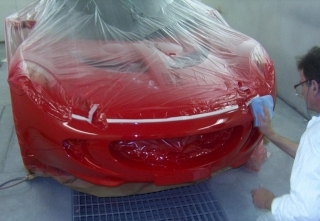 Almost all modern manufacturers produce vehicles with a paint finish that has an “orange peel” effect when viewed carefully. The paint finish is not flat, like glass. The amount of orange peel varies on makes of car, sometimes even differing on models from some manufacturers. A skilled painter will vary his spraying techniques to reproduce the original finish. Sometimes a daunting task, as the paintwork on some new vehicles is actually very poor in painter’s terms. The finest of repairs should be virtually indistinguishable from the rest of the car. This is our goal at Option 1 for any repaired area. 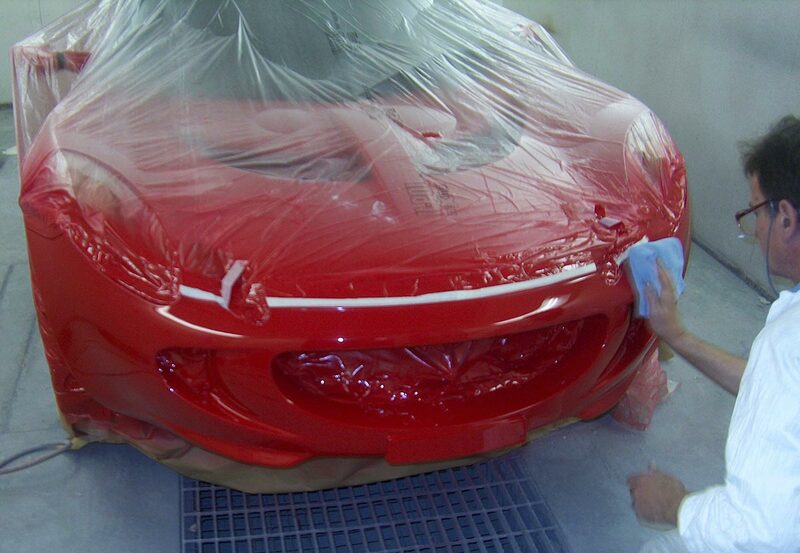 When refinishing a complete vehicle, unless instructed otherwise, we do not replicate the contemporary “orange peel” paint finish of new cars. However well painted, paint or lacquer will not lay completely flat. There will always be some degree of peel. After we have applied and fully cured the paint, we sand down the newly painted surface to remove all orange peel. We then machine and hand polish to produce a high gloss, glass like surface. This paint finish is both pleasing to the eye and very practical as it’s easy to keep clean. Unfortunately the process to achieve this is very time consuming and technically quite difficult. This is why virtually no manufacturers and very few body shops will do this properly. An Option 1 paint finish is very special. If you are considering a full respray and have not seen our work, please call and we will try to arrange this for you. Pin stripes, Racing stripes, roundels and two (or more) tone paint designs are no problem. Complex stencil and free hand air brush work is also welcome as is vinyl or sticker application and lacquer. 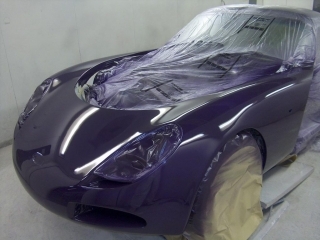 In addition to the normal, solid, metallic and pearlescent we offer a full range of bespoke and amazing paintwork, including Metal Flake, Chameleon or Flip tone, Candy, Matt or Satin, Heat sensitive, Chrome, Glow in the dark and more. Available for use on cars and motorcycles. We will happily provide anything you require. Please ask for details. Pride in our work is paramount at Option 1. Attention to detail and skillfully spending the time required is the basis of our reputation. We have a large amount of customer testimonials available to view. Please view our galleries or contact us for more information.